Energy loss as electromagnetic waves pass through. This energy loss is usually converted to thermal energy. Absorption is highly dependent on the thickness and magnetic properties of the shield. Energy reflection when electromagnetic waves encounter a material. 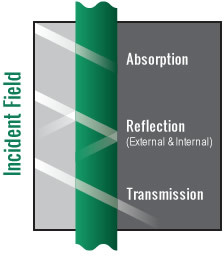 Reflection can occur from both the front and back surfaces and within the material, independent of the materials thickness. Energy passing through a material with minimal disturbance.